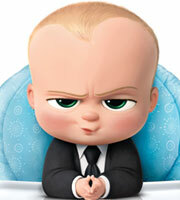 DreamWorks Animation and the director of Madagascar invite you to meet a most unusual baby in DreamWorks’ new animated comedy The Boss Baby. He wears a suit, speaks with the voice of a corporate executive, and whilst all his parents see is a wonderful new addition to the family, his older brother sees him for who he really is…a baby on a special secret mission. This film will be open captioned on Tuesday 11 July. Audio description headsets are available to patrons for both screenings on 11 and 13 July, but must be booked prior to the screening.